Every time I buy paneer, I end up making simple paneer bhurji as its quick and tastes great with phulkas. 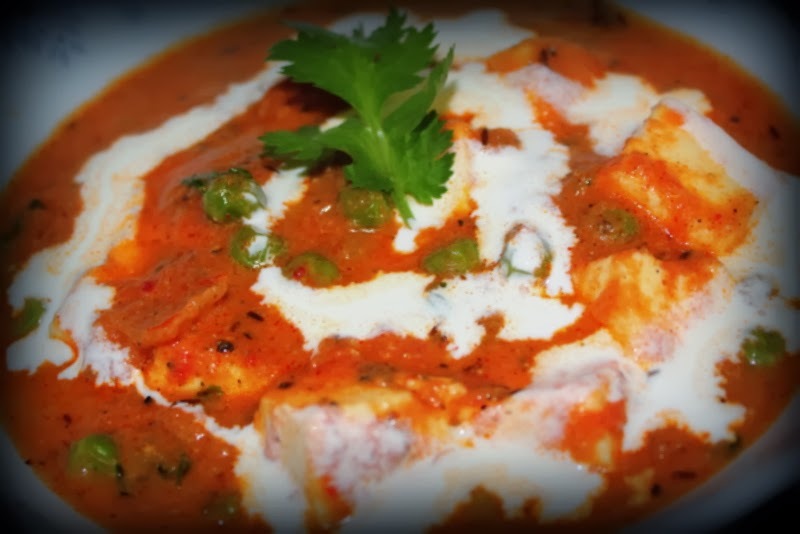 Today I wanted to give extra attention to paneer and make something rich and creamy!! To make it healthy I am adding fresh green peas to the curry. 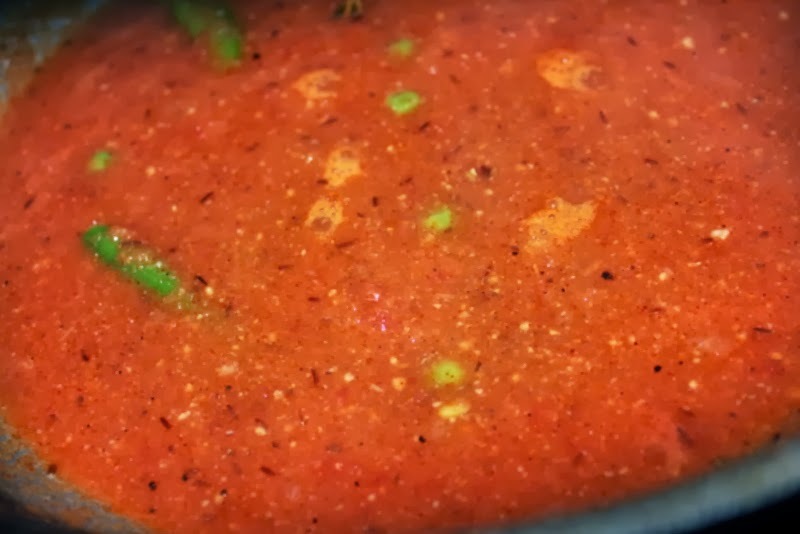 Perfect gravy recipe to please vegetarian guests!! 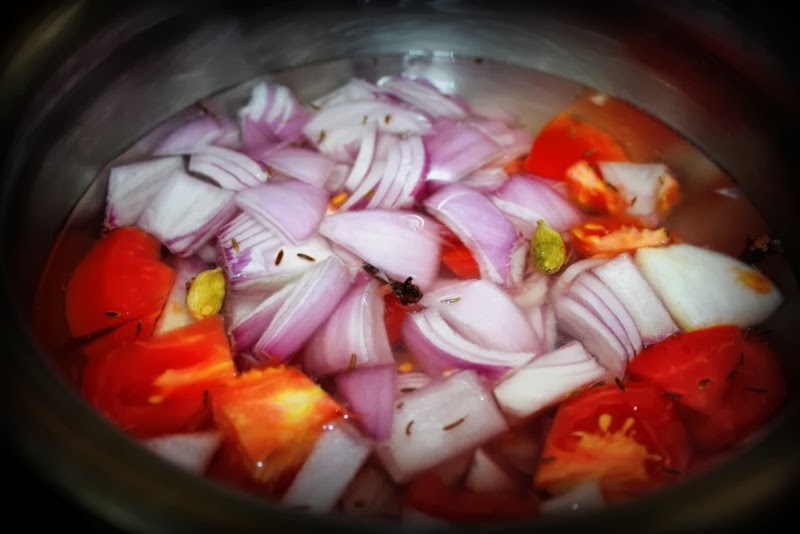 Boil onions, ginger,garlic,tomato,clove, cardamon in 1 cup of water. Once they are cooked, cool them and make a paste in blender. In a nonstick pan saute paneer cubes for few minutes and keep aside. Blanch green peas for 5 mins and keep aside. Now in a kadai add butter with some oil, fry shahi jeera until they change colour and then add chilli powder. Add the peas and fry them for 5 minutes. Put the blended masala paste and tomato puree to this with green chillies and cook for few minutes. Add the sauteed paneer cubes in the kadai and mix them all together. For seasoning add salt, pepper, garam masala. Crush kasoori methi with your hand and add to the gravy. Cook this for 10minutes. Feel free to add your own touch with lime juice! Sprinkle fresh coriander leaves and garnish with fresh cream. Serve hot with phulkas or jeera rice! 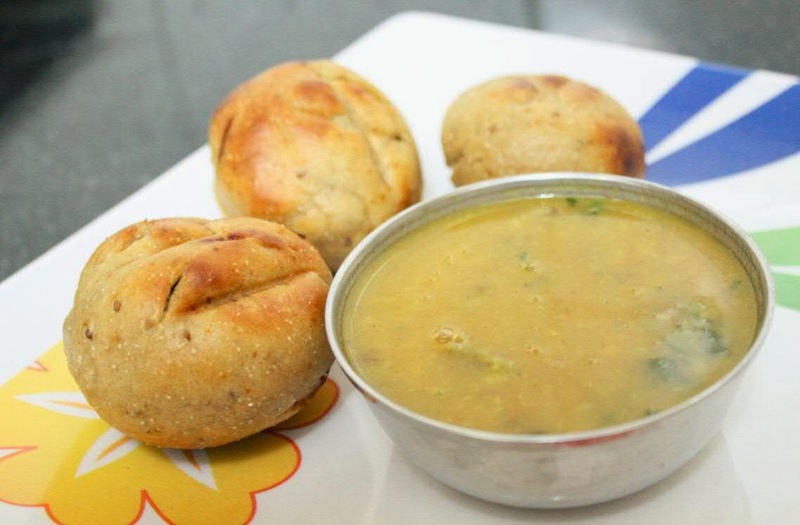 Daal Baati is a popular dish of Rajasthan. This rich and flavourful dish is commonly served at all festivities, what started as a picnic food has become a distinctive cuisine of Rajasthan. My colleague, lovely Meena was willing to share this delicious recipe with all of us. Thanks again so much for giving us this rich and yumm delicacy!! The Baatis are traditionally roasted in an open coal fire, you can always buy baati cooker if you intend to make them often, its easily available in stores. If not you can also cook them under a grill or in your oven. 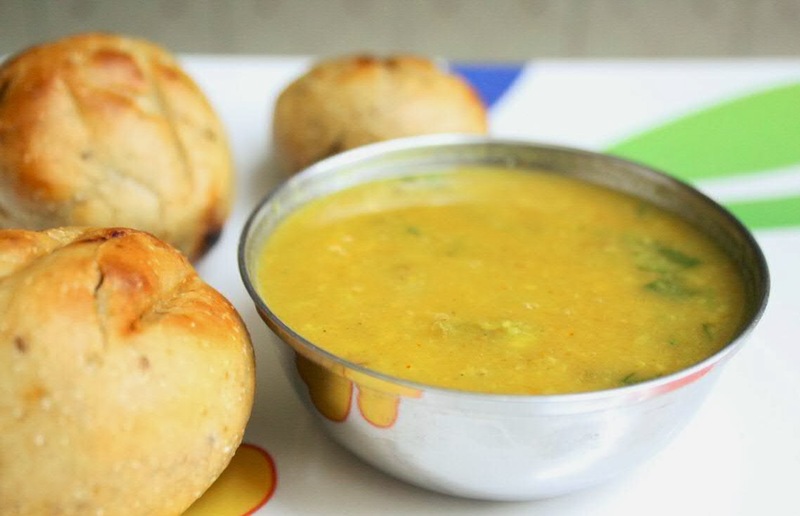 But one thing common for baatis, irrespective of their cooking technique is that they are always served dipped in ghee accompanied with thick Daal which is traditionally made with a number of different types of lentils, you can use as many as you have at the moment! This dal is cooked with ghee, the masalas in the dal are fried in ghee and more ghee is mixed into the dal before serving. Often a large batch of baatis is made and part of the dough is left unsalted. This unsalted dough then shaped into rounds and deep fried in ghee!! Mix flour, sooji, salt, ghee, little water and make a firm dough. Knead the dough for 5 minutes until smooth. Cover it with wet cloth and keep it aside. 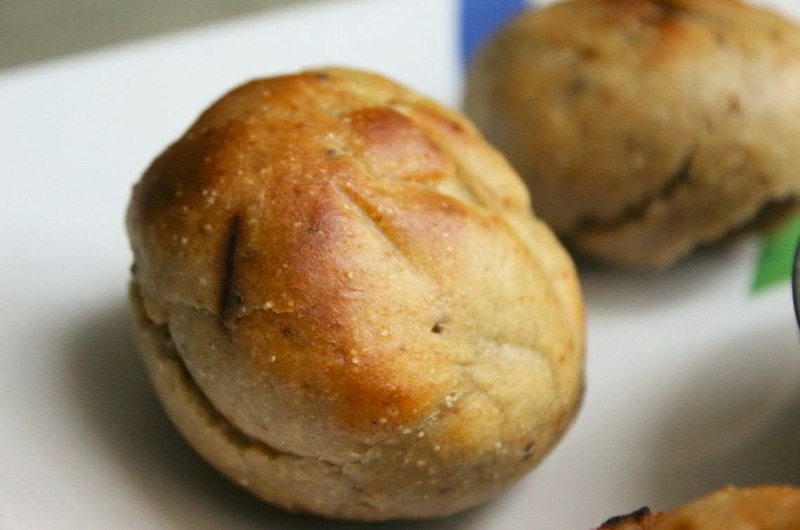 Divide dough into 10 equal portions and roll each into a ball, flatten each ball into a thick disc and press in the centre to make an indent and put in the daal baati cooker. Cook on each side for about 5 minutes, until they turn into golden colour! Alternate way of making these baatis if you dont have the baati cooker is baking them in the oven. Boil water in a deep pan, add the baatis and cook on high flame for 15 minutes. Remove from water and arrange on a baking tray. Preheat oven to 200C and bake until the baatis are golden. brush them with ghee and serve hot with dal! Wash all the dals and add turmeric powder, salt and pressure cook for 2-3 whistles. In a pan, add oil and add cumin & mustard seeds, hing and once they start to splutter add tomatoes, chillies, garlic, chilli powder, dhaniya powder and saute for another 5 minutes. Now add the cooked dal and mix everything thoroughly, check the seasoning and add salt if required. Arrange the baatis on a serving plate, break each baati, press lightly and soak in a bowl of ghee, then drain and serve with hot dal! I loooooooove eggs, big fan of them! Its my go to curry when I am bored with veggies. 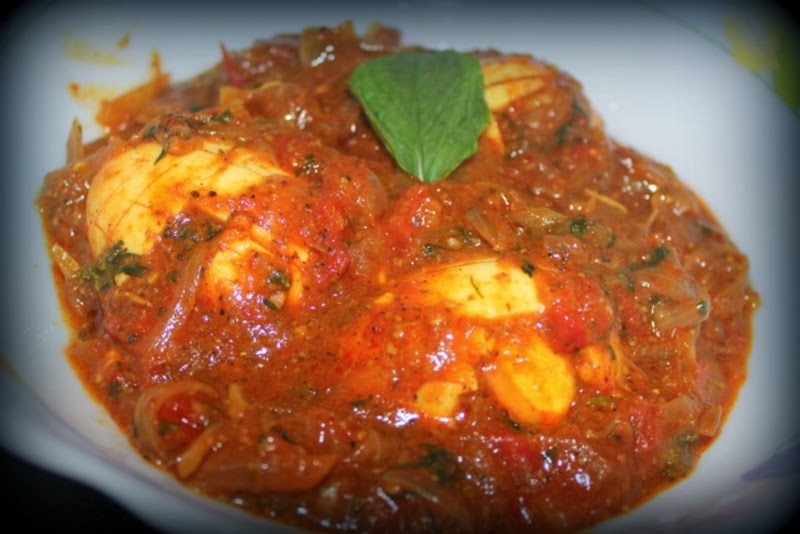 This is one of my favorite egg curry recipe, as I love intense spicy curries!! It goes well with steamed rice, jeera rice or even with roti/paratha.If you wish you can simplify the recipe and give a miss to the spices to make it mild if spicy food is not your forte!! Boil eggs, peel them and set aside. To make the masala heat 1 tsp oil in a kadai. Add all the spices mentioned above and roast them on low heat till they change colour. Take them in a blender, add some water and make a smooth paste. Now add more oil in the pan and add curry leaves, onions, gg paste, salt and chillies and fry this for 2 mins until onions turn into golden colour, add tomato puree and cover the pan with a lid and cook for 5 mins. Add the blended masala and cook for another 5 minutes. You can add some water according to the consistency you want. Make lot of slashes on the boiled eggs and add them to the gravy and let them cook for 10 mins till the oil floats on top. Garnish with some fresh coriander and serve hot with garam garam rotis or steamed rice!! Happy new year everyone, hope you all had a great vacation and spent quality time with family on holidays! So I am back into kitchen, making quick and easy dishes for my loved ones. One question that bothers every women while sleeping is what to cook for breakfast tomorrow!! Especially if you are working and you have to rush to office in the morning. 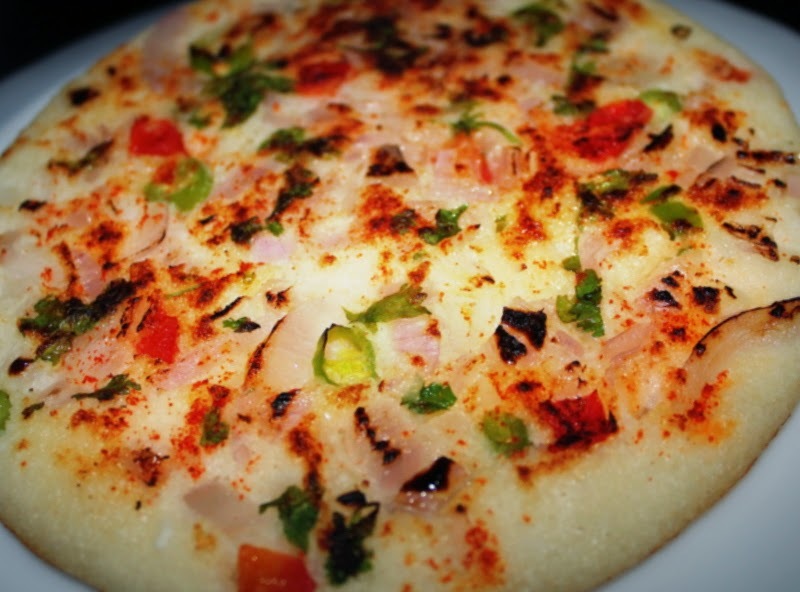 On weekdays, I usually prefer quick breakfasts like oats, cornflakes, fruits….but my south indian instincts hit me sometimes and I crave for idlis and dosas so I make dosa/idli batter and store in refrigerator and use it for a week. To make them interesting, I add some twist to the routine recipe. One such recipe is uthapam. You can make them in so many ways, with ingredients readily available at home. So here’s a simple, delicious, spicy and nutritional recipe for those busy mornings!! Take a non stick pan, when it gets hot put a ladle full of batter and spread it evenly on the pan. Remember to not make it too thin lik a dosa, uthapams taste better when they are thick like pan cakes. 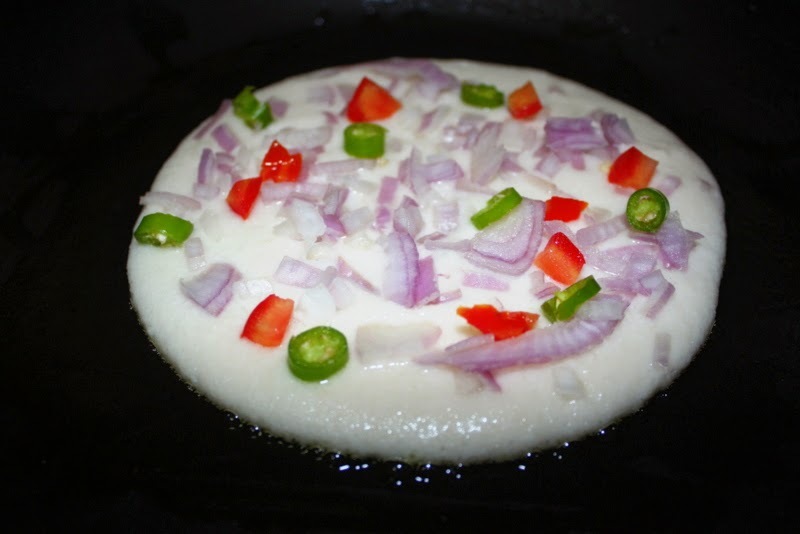 Now, spread onions, tomatoes, chillies on the uthapam generously, sprinkle some chilli powder/gun powder, salt and finely chopped coriander leaves. 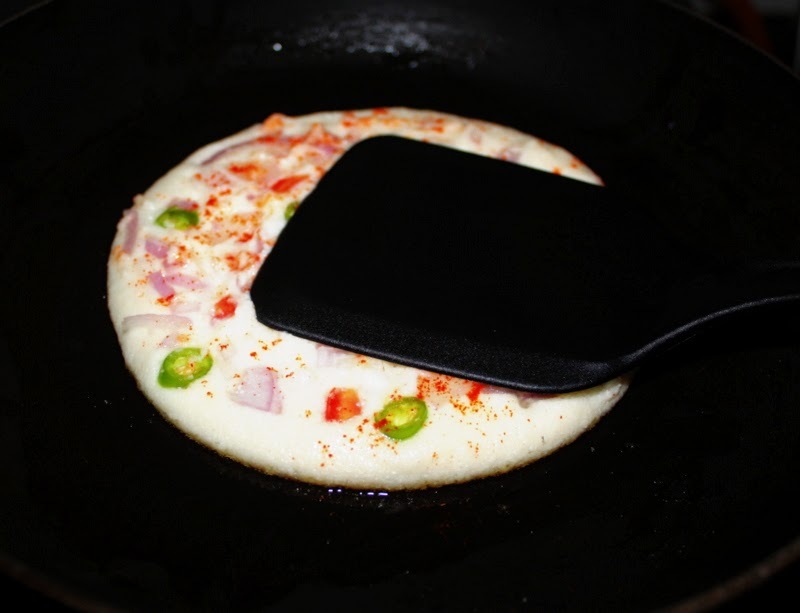 Press the toppings with help of a spatula and oil on the sides and cover with a lid. Let it cook on low flame for 5 minutes, then flip it over and cook for another 5 minutes. 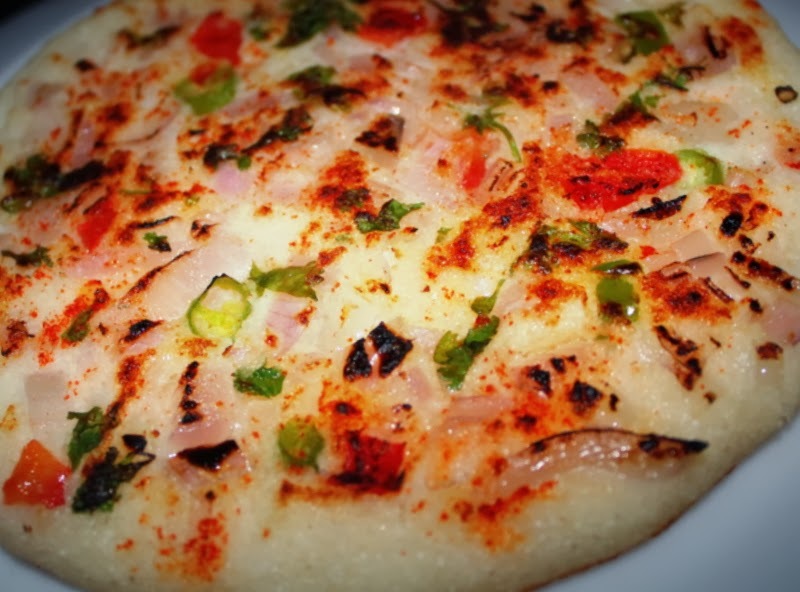 Ta da…hot and spicy uthappam is ready, serve it with any chutney! You can add any veggies like green peppers, ginger, corn. If serving for kids add some ketchup on top, they will enjoy eating it like a pizza!